Greetings and salutations, everyone; yes, once again it is I, Mani the fairly regular-sized purebred border collie, filling in for the guy I live with, and here to bring you the very latest news from our garden. You may remember me from such posts as “The Pine Cone Chronicles”, among so many, many others. Here I am in a characteristic pose. I look rather carefree, don’t you think? Well, that was later today. This was me earlier. It was thundering. Fortunately my Kitchen Fort was very close. The guy I live with said that a huge, no super-huge, thunderstorm was passing to the east of us, not heading in my direction, that is, but we could still hear the thunder. Of course he said that two years ago last Tuesday (which was also an anniversary of something even less pleasant) that he and Chess spent some time downstairs listening to tornado sirens, and so he made sure that his cell phone was charged in case we had to go downstairs and cower. But nothing happened here. It barely even rained. I still didn’t like it. You may be wondering why there haven’t been so many posts lately, and it turns out that the real reason is that the guy I live with sometimes forgets that there is a blog. This past Tuesday his friend came over, because she thought he might like the company, and I got to say Hi and stuff. I really like her. They watched The Wrong Trousers, which she’d never seen, and we all went on my evening walk. 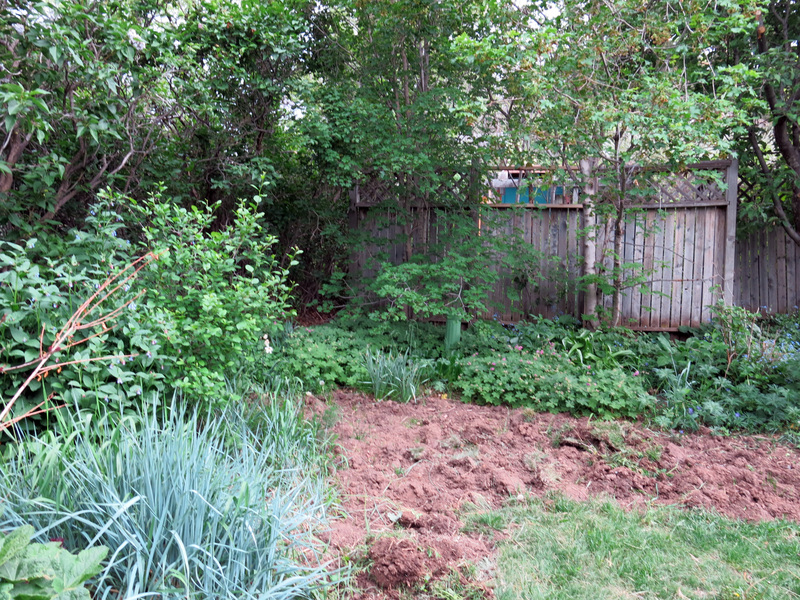 We’ve also been pulling weeds. The guy I live with says there are more weeds in the garden now than ever before, and he blames all the snow we got earlier. I say “we” because I do help with the grass-pulling, though I can’t eat it all. The grass (smooth brome, the “awfullest plant on the planet”) has even gotten into the front yard. It’s the grass in the field, and surges against the back fence, trying to get in, which it does, fairly successfully. You can see it here, in front, growing in the Anemone sylvestris. 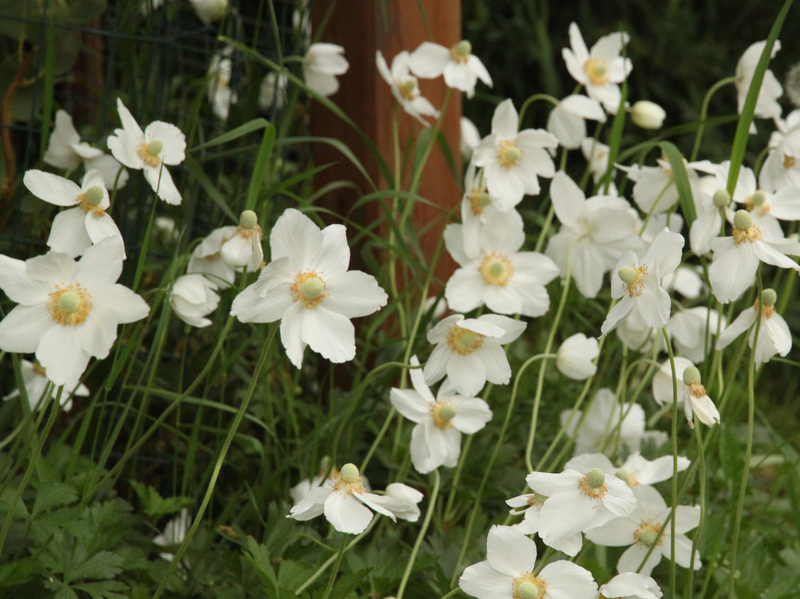 The anemone is really a “side-yard plant” but often sneaks into the front yard, under the shade of the big Arizona cypress. 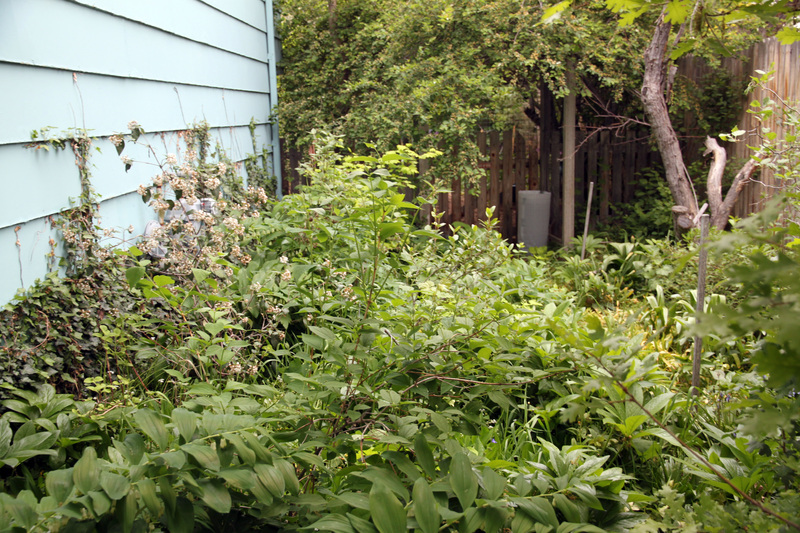 The side yard, or really, the shade garden, is “a hopeless jungle”. There are, surprisingly, not very many weeds here. The tree you see on the right there is dead. The guy I live with says it was struck by lightning years ago. 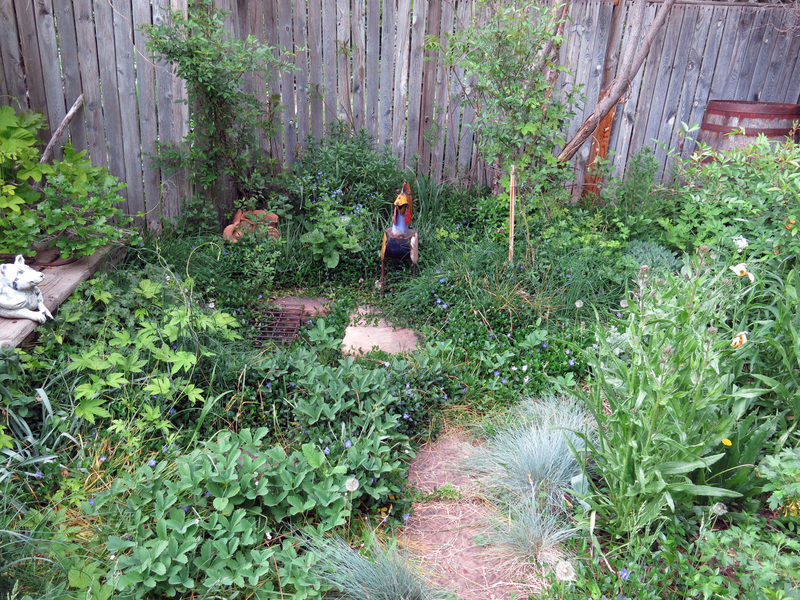 The back yard is pretty weedy, though. Lots and lots of dandelions and bindweed, and “the accursed grass”. You can see the orange oriole feeder there (left of the shed door); we haven’t had any orioles yet, probably because the robins have been gulping down the grape jelly. Of course there are things in flower. 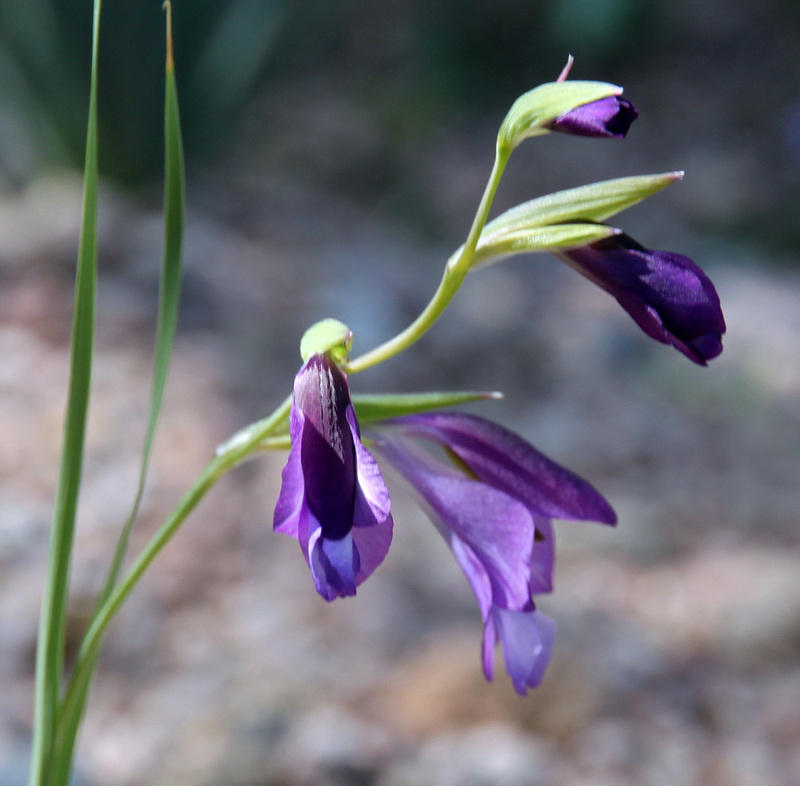 Here’s Gladiolus atroviolaceus, for instance. There’s also some peculiar work going on here, which must have a point. 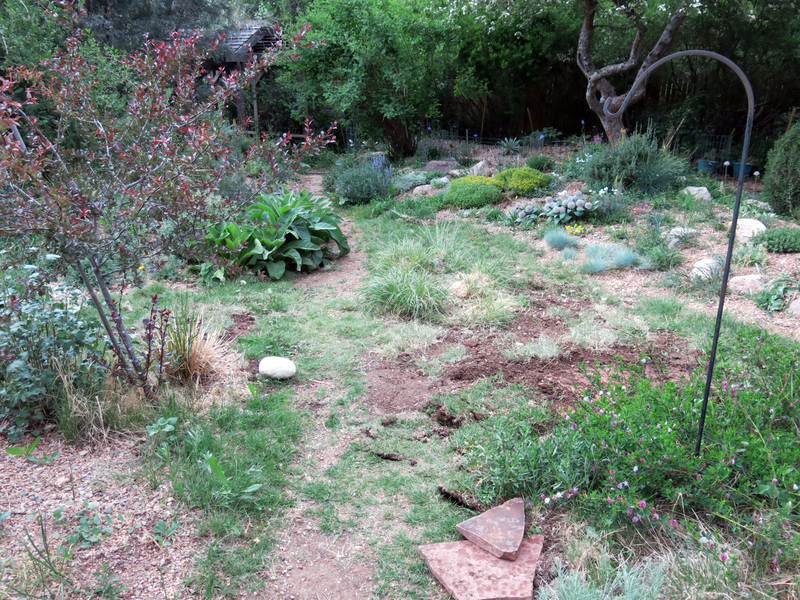 You may be able to see some of the buffalograss which was moved from the “way back”. The regular grass, which came back even though it wasn’t supposed to, is being dug out. That much I know. The white thing there is one of my stuffed toys, and it’s still stuffed, and still squeaks. So what I thought was super-mysterious in the “way back” is really just some of the buffalograss being moved. And remember how I said the dirt was reddish here? You can see that it is. You can see it here, too, on the path that leads south to the trough patio and, way off to the right where you can’t see, the Employees Only section. There was grass on the path before I showed up. The anti-me fence on the right does lean a bit, doesn’t it? 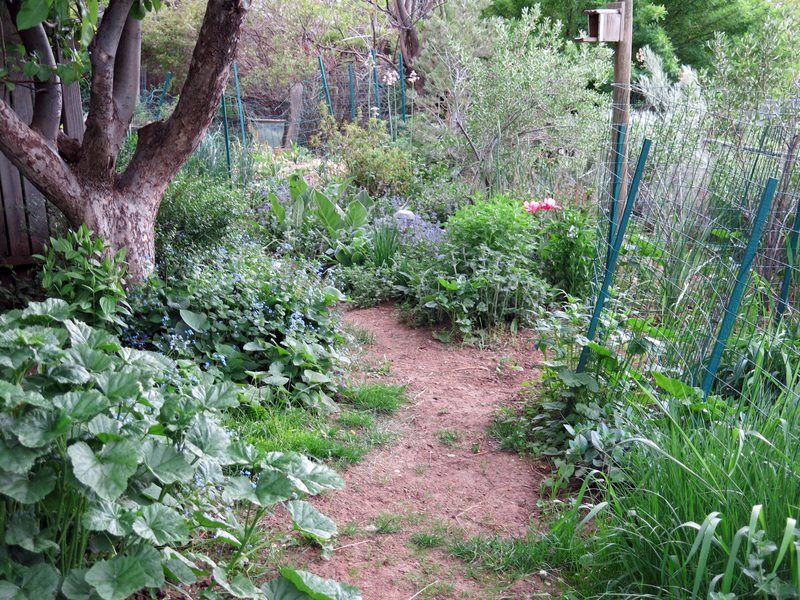 The fence you see straight ahead is for the little garden with juno irises in it. And take a look at “the enclosure”. Not very many weeds there, because the vinca has taken over everything. There is a dandelion seed-head, though. Well, I guess that’s it for today. The guy I live with says he would rather see the sun, and that we don’t need any more weather like this, because it makes both of us apprehensive. I’ll leave you with a picture of me being all apprehensive and everything. Not because I am now, but because I’m so attractive in this pose, as I’m sure you’ll agree. Hen it thunders and I am certain that the guy you live with will do the same for you. Meanwhile the bees are loving all the spring blooms this year. Thanks, I do get extra cuddles when it thunders. The guy I live with now says we might see the sun some time in September. …. My Dixie as hiding under my desk because she really, really hates thunder too. 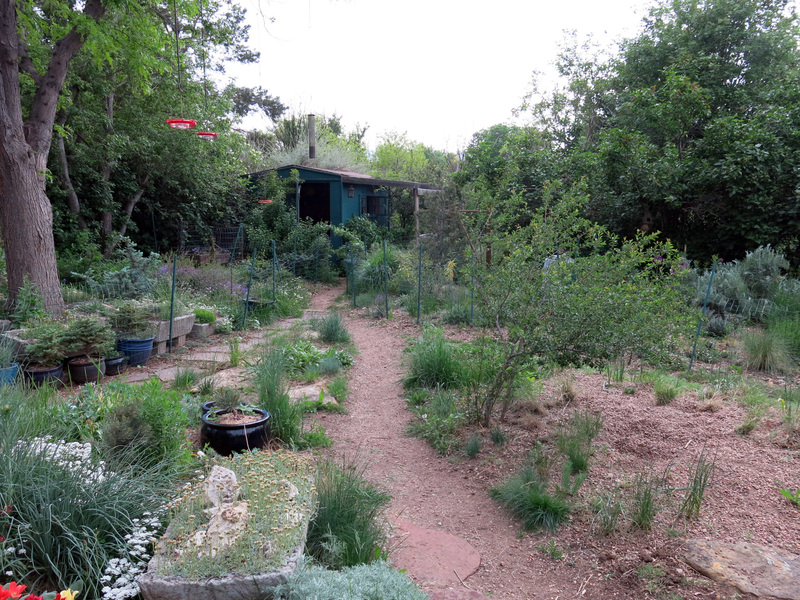 We also have way to many dandelions and that awful bindweed – lots of weeding to be done. Indeed, thunder is scary. And there are weeds everywhere, or so I hear. Lucky girl, who gets to see The Wrong Trousers for the first time. The weather has been crazy all over: I went to Seattle early this month (Seattle, the place so cloudy that vampires are free to roam at high noon) and got a sunburn, then I came home to Long Island and had to wear my Winter coat every morning until last week, when we had 7 days of Spring and now are hitting 90 degrees of Summer. No thunderstorms yet, but I have my emergency supply of champagne and mac’n’cheese laid in. The guy I live with says A Close Shave is next, followed by (ooooo!) Curse of the Were-Rabbit. A Matter of Loaf and Death is pretty good too, but he doesn’t know how Helena Bonham Carter and Ralph Fiennes were able to deliver their lines without cracking up. He also says he’s been reading a bunch of whiny Facebook posts from gardeners in Seattle and Portland, Oh, it’s too hot, whatever shall we do, when the cool weather that they expect bring hail and tornadoes here. 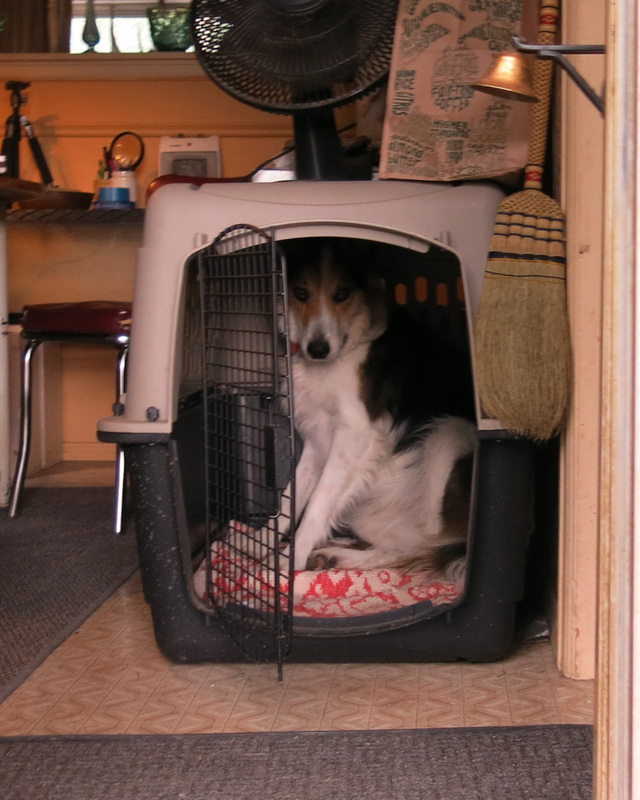 The guy I live with is super-against hail and tornadoes. And he also says that the very dark, gloomy day we experienced today might be “a sign” of the way summer will go, with four straight months of darkness and thunderstorms, like it was in 2014, before I was born. I’ve never had macaroni and cheese, but I hear good things about it. The guy I live with would make it like his mom did, of course. I must like hopeless jungles because I admire your shade yard, and all your other yards weedy, overgrown, whatever. You are not at a loss for environments, Mani. The white of the anemone is very pretty, and I appreciate gladiolus – atroviolaceus or not – and anyone who can grow them. No thunder hereabouts, but this being Memorial Day weekend, lots of fireworks and 21-gun salutes. Somehow Petey Dog can hear the volleys through triple-pane windows, so we have hugged mightily. 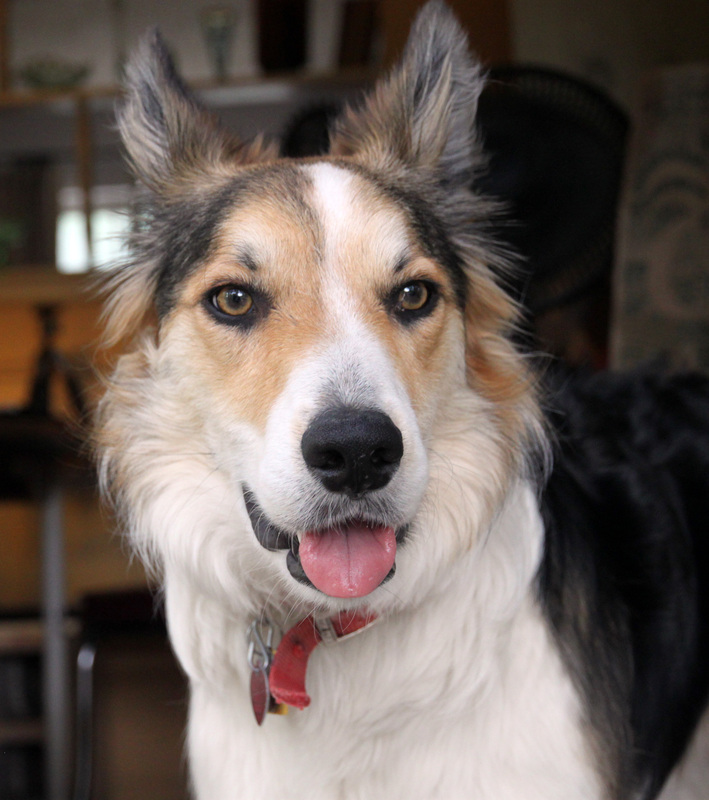 You are a handsome border collie in all of your photos, Mani, but the characteristic pose shows you stunningly handsome. Life has been fraught around this corner recently, fraught I tell you, and the heartbeats slow down and serenity and humor return when I read those recruiting opening words, “Greetings and salutations, everyone; yes, once again it is I, Mani …” Please remember to fill in on the blog each week once again, dear dog, even in the presence of new friends. Thanks; it thundered today but I didn’t care very much. I got a treat instead. 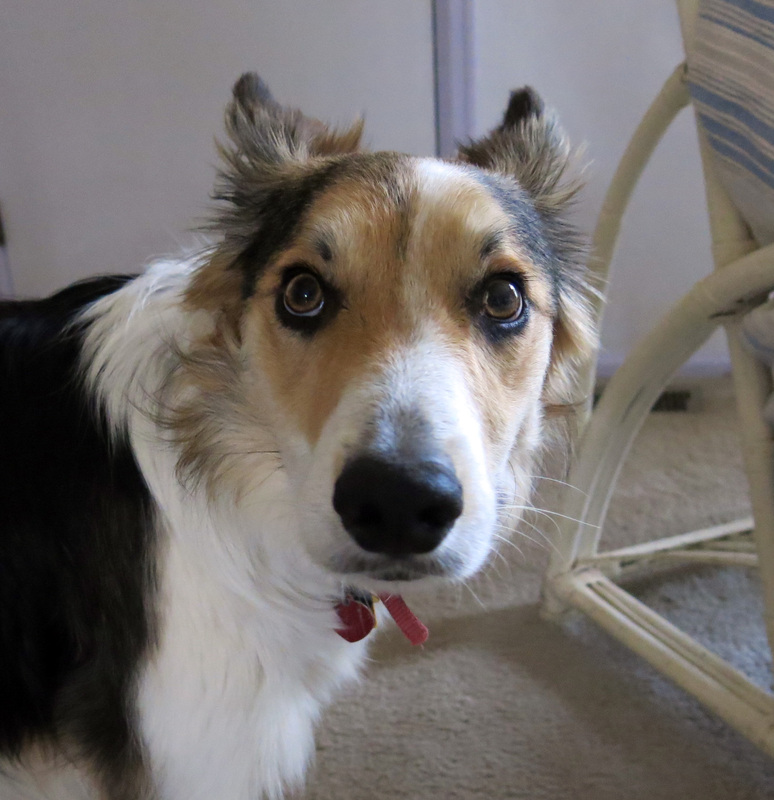 The guy I live with has a friend who suggested giving me treats every time it thundered, so I might not be as terrified of thunder as the other purebred border collies who lived here were. Chess was super-terrified of it, but the guy I live with says he was kind of sappy, whereas I am totally lean, mean, and ultra-tough. He says he’ll try to remind me to think up something to post about while he takes pictures. P.S. Note has been taken on all of those films. We hope so….never seen The Wrong Trousers? They also watched Oliver’s Travels which I guess is pretty delightful. Though the only TV here isn’t much bigger than a piece of typing paper. Oh, I mean printer paper.